You might think senior citizens would shudder at the thought of a throng of teenagers and 20-somethings moving in down the block, but the so-called “elders” at the Bridge Meadows affordable housing community in North Portland are welcoming them with open arms. 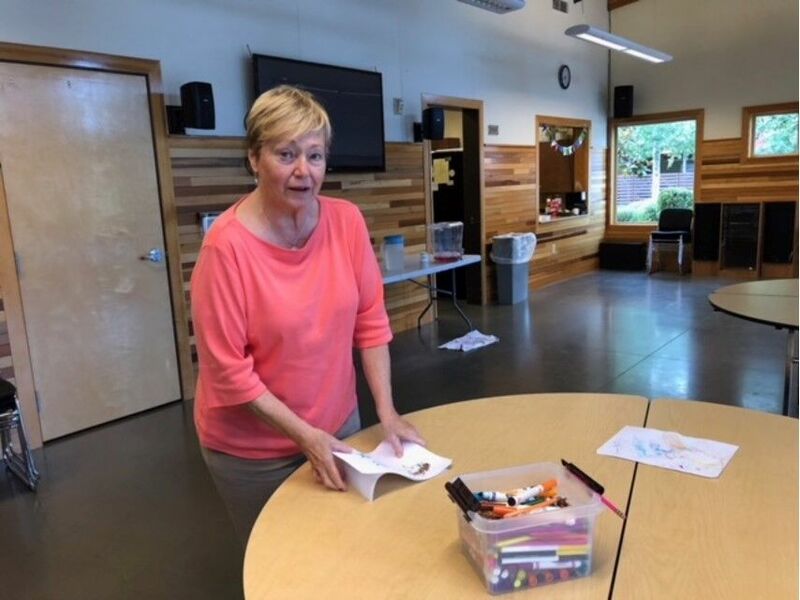 Happiness Hour is a weekly event in the Bridge Meadows central gathering room, where the seniors mingle with their younger neighbors who adopted through the foster system. “Happy Birthday to you, Happy Birthday to you …” sang the residents on a recent Wednesday afternoon to recognize that month’s birthdays. One of the elders who works in the kitchen helped serve cake as excited children ran in and out of the room. But beginning this week, things are changing at Bridge Meadows, which opened it’s doors in 2011. The community is making room for at least 15 new faces – all foster youth who are transitioning out of the foster care system. This intentional community, with support and outreach services for foster youths, is believed to be the first of its kind in the nation. The first to move in, 20-year-old Zahra, just finished settling into an apartment at the newly-constructed Dorothy Lemelson House, on North Dana Avenue, just one block from Bridge Meadows, where the elders and young families reside. “I fell completely in love when I first saw it,” said Zahra, a third-year student at Portland Community College. Zahra, 20, was the first to move in and just finished settling into an apartment at the newly-constructed Dorothy Lemelson House, on North Dana Avenue, just one block from Bridge Meadows, where the elders and young families reside. The Dorothy Lemelson House is home to the New Meadows Project in partnership with New Avenues for Youth, and Zahra (who uses the pronoun they) was a speaker at its groundbreaking. Bridge Meadows Executive Director Derenda Schubert said partnering with New Avenues for Youth is the best way to offer young people the benefits from both organizations in one location. Juravic and other elders at Bridge Meadows are eager to reach out to the new tenants. As a former real estate agent, she sympathizes with the challenges these youths face, and it’s not just steep rent. “Eighteen years old and it’s goodbye and good luck? I mean, what chance do they have?” Juravic said. She and the elders are doing what they can to make the move easier. They helped stock the youths’ new community kitchen, and many elders are ready to help with babysitting if any of the new tenants have children. “We’ll say ‘come on over.’ We’ll have something to eat and get to know them,” said Juravic. It is not often that two established organizations – Bridge Meadows and New Avenues for Youth – would agree to combine services to create a joint project of this magnitude, according to Sean Suib, New Avenues for Youth Executive Director. The New Meadows project took five years of work by the organizations’ boards and leadership teams, and cost $3.4 million, with $1.4 million in city funding. Suib said the project is essential for youths who have spent years in a paternalistic foster care system. “They often find themselves at the end of the road, without any natural social capital relation-ships that they can rely on, to help with what we know is a much longer journey to adulthood than just a ‘hey, you’ll figure it out,’” Suib said. New Avenues for Youth has an established program to help youth transitioning out of foster care called PDX Connect. Suib said it provides a whole list of services, including case management, on-the-job skills training and assistance with college preparation and execution. At the Dorothy Lemelson house, New Avenues for Youth is providing that menu of services as well as an on-site resident assistant with a background in social services, and a master’s level counselor, whose office is located right next to the New Meadows community living room and kitchen. Suib said the role of the case worker will be to work with the foster youths on their transition to independent living. Even millennials who are raised by their biological parents are struggling to find independence by their late 20s, Suib said, but to their advantage, they have their parents’ home as a safety net. “If that’s the reality of what it takes economically and emotionally for young people to transition to adulthood, on what planet do we think young people can do that on their own at the age of 18, when they’ve been in systems of care that foster dependency?” Suib said. The 10 studio and five one-bedroom apartments at the Dorothy Lemelson house are not rent-free. Residents, aged 17 to 25, will be expected to pay what they can on an increasing scale, be enrolled in college or working a job, and participate in an embedded savings fund for their future, which will grow larger the longer the youth stay with the program. Suib said two, part-time “engagement specialists” will help the new residents connect with the elders and families at Bridge Meadows, as well as the larger community around them. “The hope is that these young people build relationships and connections to the Bridge Meadows community which last for life,” said Suib. Bridge Meadows leaders say that without the help of projects like this, the statistics are dismal. According to the National Foster Youth Institute, 20 percent of youths who leave foster care at 18 become instantly homeless, and many more are at risk in the immediate years after aging out of the system. Former foster youth are also statistically more likely to face substance abuse, unemployment, incarceration and early parenthood. Directors from both agencies say one of the key components to making this community work is the elders’ participation. Before moving into Bridge Meadows, seniors commit to 100 hours of “engagement” (per quarter) with the younger members of the community. However, staff there say most elders go well beyond that time requirement. 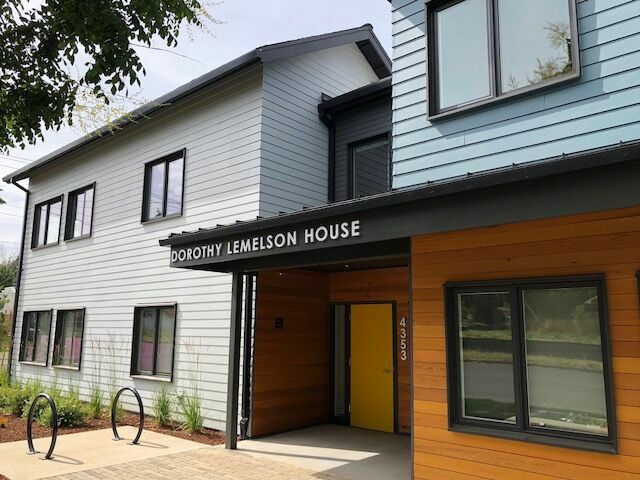 The Dorothy Lemelson House is the home of the New Meadows Project, providing apartments for foster youth aging out of the system. New Meadows was created in partnership with Bridge Meadows housing community and New Avenues for Youth. The elders choose their interaction levels. Some help in the laundry room, read to youngsters in the library, help care for children in the lounge or assist in the shared garden. Others, like Mary Johnson, take it a step further. “I never had an inkling I’d be doing academics with children, I just thought I was here to babysit,” Johnson laughed. Johnson is a retired school teacher who taught at the same school that once stood at the sight of Bridge Meadows on North Wayland Avenue. “I do academics with the kids during the day, and the night is all me,” said Johnson. Johnson tutors her neighbors’ two grandchildren Reba and Lydia, but her “engagement” goes well beyond the simple lessons. She attends their recitals, science expos, church and even a recent primary school graduation. “I just look out for them and make sure they’re safe around here,” said Johnson, as she spotted one of the children meandering out of Happiness Hour. Johnson decided she wanted to be a teacher when she was in grade school. She spent time with a developmentally-disabled family friend and was surprised when she noticed him repeatedly, breaking potato chips with a rocking chair. Up until that point, she didn’t know anything about autism, but right then, decided she wanted to help people. Johnson admitted she doesn’t keep track of the hours she spends with the children, but she knows she’s blown past the time requirements. Now, with the New Meadows program beginning, she sees more opportunities to interact with young people. “They probably can show me some stuff, especially about those computers and stuff,” Johnson joked. The architects of this community say the benefits of intergenerational living go both ways. As the elders donate their time and effort, they also reap the rewards of finding new purpose in life. “Now I have a reason to get up in the morning and not wear my pajamas and watch the Price is Right all day. That is a quote from an elder,” said Schubert. Patty Juravic, a resident at Bridge Meadows, cleans up children’s toys in the community room. She believes many elder residents are looking for a sense of family. They want to belong to something bigger than themselves. Whether that means being a friendly neighbor or a stand-in grandmother, Schubert said the elders will gradually make those connections with the New Meadows youth. “It’s not the stage of life where you hang out with your grandma too much. But over time, we think relationships will be built,” said Schubert. “The elders and the parents here are being very understanding and respectful, in that it’s going to take time,” said Schubert. “It does make everything a little easier having a person you can talk to, or keep you company, or do classes with …” said Zahra. Those at Bridge Meadows say there is another bonus for elders who take the time to build strong relationships with community members. Staff members say, by avoiding isolation and loneliness, the elders may see better results at the doctor’s office. The elders seem to get it. Bridge Meadows has a two-to-three year waiting list for seniors wanting to move into one of the elder units. Management is scrambling to open new communities around the area to keep up with demand, but at this point, they say, they can’t build them fast enough. Those behind the concept of Bridge Meadows and the New Meadows project in the Portsmouth Neighborhood say this development is just the beginning. Bridge Meadows already opened a second intergenerational community in Beaverton. And a third location, in the Rosewood Neighborhood of East Portland, is now in the works. Both the Portsmouth and Beaverton locations are based on the same model. Elder, family and youth housing units interspersed around a central courtyard. Both facilities include a community room with a kitchen, various gathering areas, a library and art spaces. This model is the first of its kind in the nation, according to Suib. “It’s ideas like these that are outside the box of what’s happening now,” he said. As for expanding beyond Oregon, the Bridge Meadows team has provided consultation for various outside projects, but Schubert said they are waiting to see how the in-state communities fare before crossing state lines to build new communities. At this point, she sees initial success. As the new residents move into the Dorothy Lemelson House, staff intends to take it slowly. They want small groups moving in at a time to allow tenants to get to know each other and bond, before the next group arrives. It’s the organizations’ intent to let residents feel out these relationships for themselves to come up with their own design. “We think it will look like whatever brings joy to their hearts,” said Schubert. Zahra hopes to live at the Dorothy Lemelson House for about a year, as they finish up an Associate’s Degree. NAFY also helped Zahra get an interview for a part-time job at the nearby New Seasons Market. 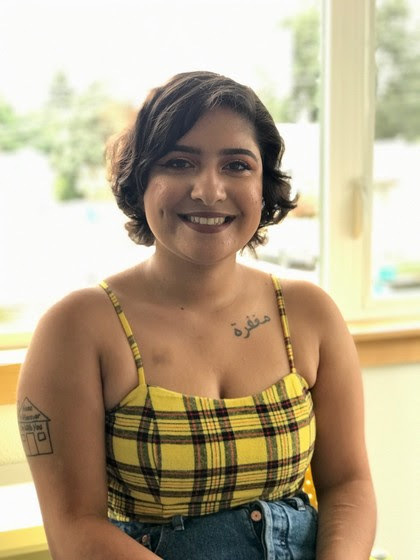 Zahra’s long-term goal is to help other foster youth, quite possibly, by working at the same location where Zahra is living now. For more information on the New Meadows Project, Bridge Meadows and New Avenues for Youth go to: bridgemeadows.org/our-work/new-meadows and newavenues.org/.